There are many ship based power stations in the world. These troubled nuclear power plants are located right on the ocean. 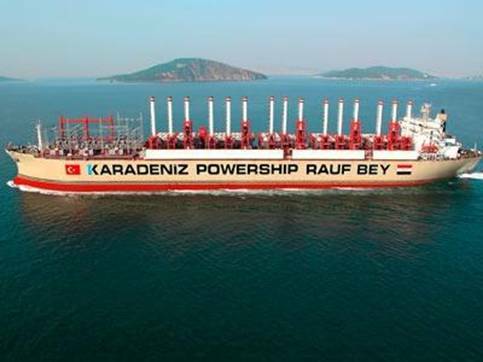 There is no excuse for not ordering one of these ships to that shore to connect to the power plants & provide the power need to run the cooling system. They could have even brought in some smaller generators to replace the failed back-up generators in the amount of time that has elapsed. The Japanese power company & government have failed to do their jobs properly. Do note, however, that the UN map doesn't tell us exact radiation levels, however, what it does tell us is that by the time any radioactive materials came to the USA, it would be 1/1000 to 1/100 as radioactive as when it was generated at Fukushima. In short ... don't worry. Not worried abut us. Worried about them. And how long that spot is gonna be hot. Nice link, thanks! The one where I live Seabrook wasn't built so well so far as people who built it tell me. These folks were first hand labor. Nothing went right, money problems delays, shoddy work in some cases, bored labor showing up and getting sea gull management. Yup, there were idiots who did get employed during construction, and I'm related to several of them too, but constant inspections and tests make potential problems come to light decades before they become actual problems. Even problems at other plants have to be addressed by Seabrook and every other nuke plant. The level of oversight, redundancy, and technical expertise at places like Seabrook would astound anyone not already in the industry. The Seabrook nuclear plant was later bought and is now operated by FPLE. And it hasn't had any problems, has it? It does lower your electric bills significantly, and it doesn't pump millions of tons of filth into NH's air, water and ground. I'm in constant contact with them. Yes there is, its called extensive radiation leakage. With this japanese tsunami and radiation crisis they won't be buying our debt. China doesn't want to buy our debt. The Middle East is in turmoil and won't be buying our debt. The cost to borrow money will increase. Even if we go crazy printing money and borrowing and increasing taxes like Obama wants to do it will collapse what little recovery we've had. Food prices are going up. Gas prices are going up. People are cutting back spending to cover food and gas costs. If Obama has a bad golf game or gets blown out of his college basketball pool, we're really screwed. Completely off topic. There are several threads about the impact of this on the United States.